Am I the only one that has song or movie titles stick in their head? Every time I try to come up with the title for a post, one of them comes up in my mind. In homage to Clint, I would like to take a few minutes to introduce you to my The Good, The Bad and The Dead (it is supposed to be The Ugly, but I am taking poetic licence. 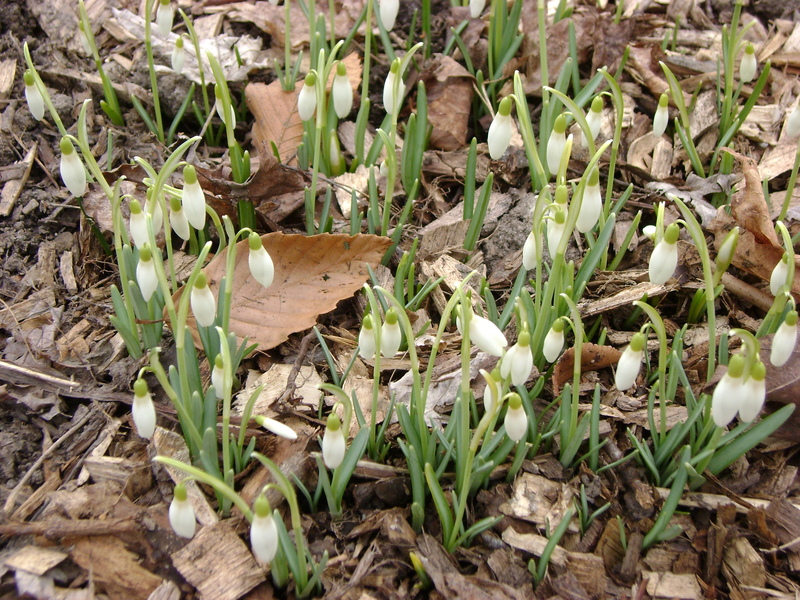 First, the Good– for me it was my snowdrops. I am sure all my regular readers know how obsessed with snowdrops I am, and my pitiful very small collection of snowdrops doubled from last year. Even better, Jen from Muddy Boot Dreams was kind enough to post me some snowdrops ‘ in the green’. This means I will probably have treble next year, very good indeed. Unfortunately we have to move on to the Bad. Last year, I bought this gorgeous golden yew from Marion Jarvies open garden. 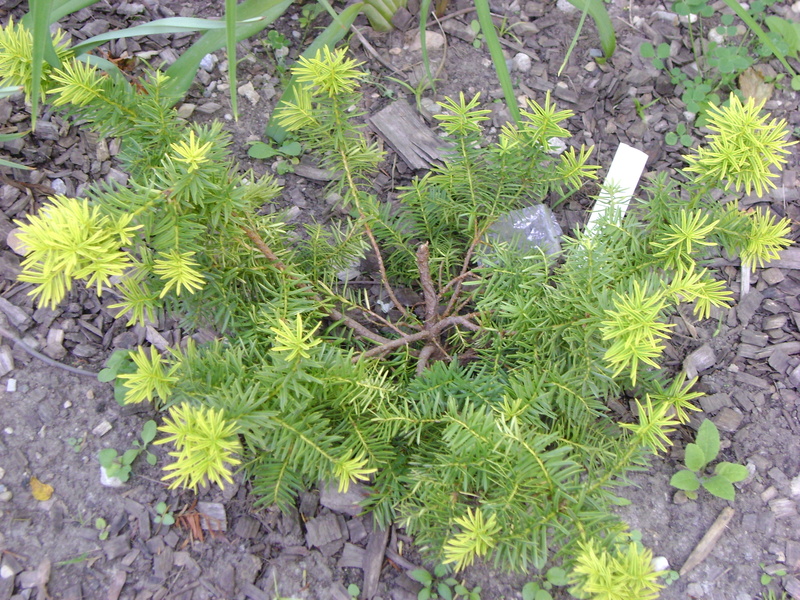 I wanted to bring more conifers into my garden, as well as foliage colours, other than green. It was a lovely pyramidal shape and looked perfect. We do get a lot of now in Owen Sound. Sometimes it is good, as it gives some borderline plants a lot of winter protection, but sometimes, not so good. The very heavy snow and the conical shape of the yew did not a good match make. As you can see, the top snapped right off. Even worse, we come to the Dead. 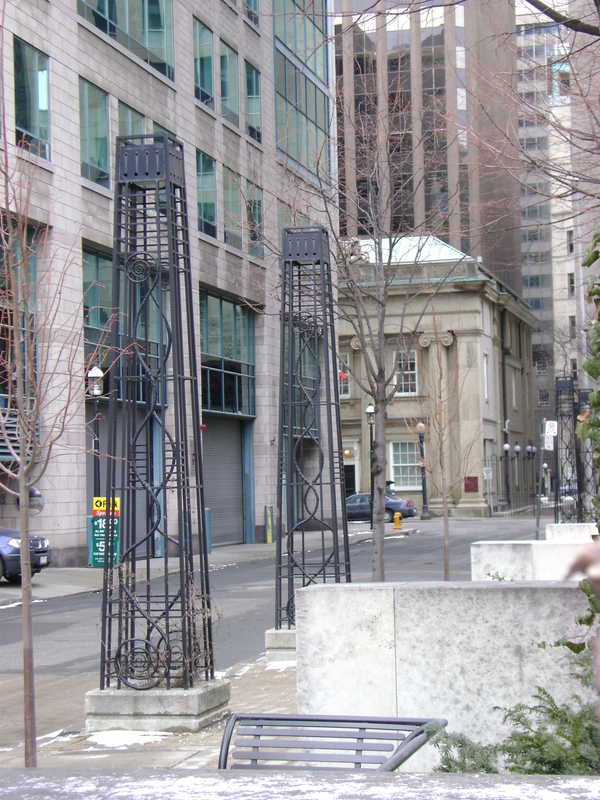 When you are planting an allee, or in this case a pleached walk, you want all your trees to match. Nothing is worse then when one of them dies, but that is what happened to me. 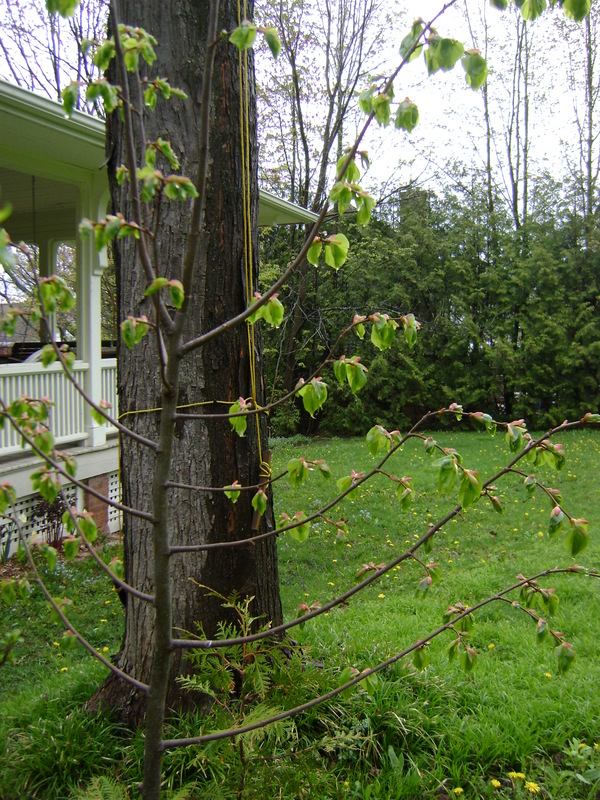 One of the linden trees in my Lime Walk, did not make it through the winter. Now it will have to be replaced and I have lost a whole growing year. But it could have been worse, the walk could have been planted a number of years ago, that would have been more difficult to match up. Now I only needed a five foot Tilia cordata ‘Greenspire’ and the walk is complete again. 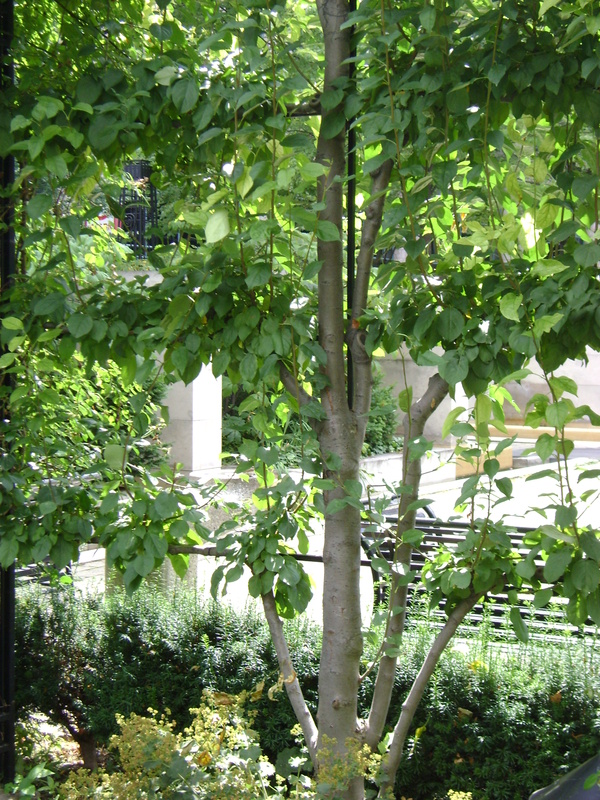 The good news is that 5 new Tilia are arriving on Saturday, one to replace this one, and I am extending the walk by four trees. After all, can you ever have too many trees. 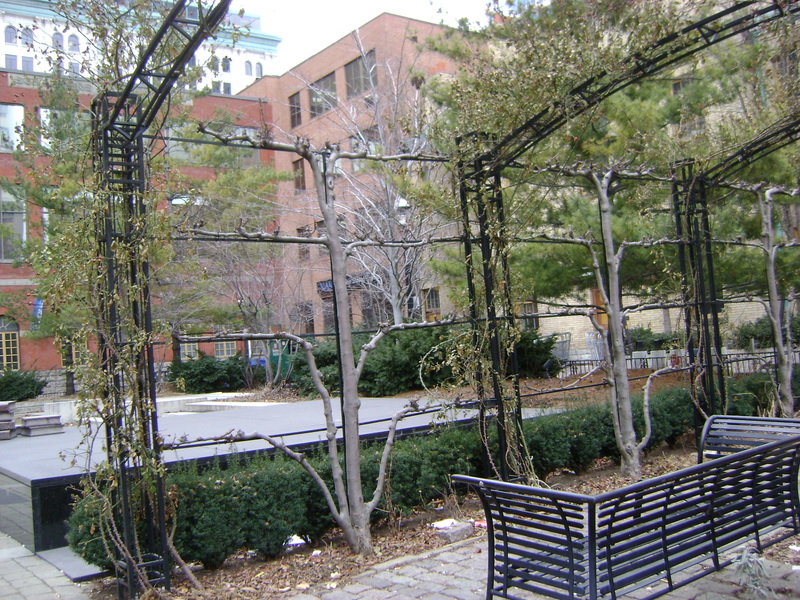 When I was studying Landscape Architecture at Ryerson University (ok, I only took the one course, how was I to know that Ian would get transferred the next year), my course instructor took the class to see this small park. 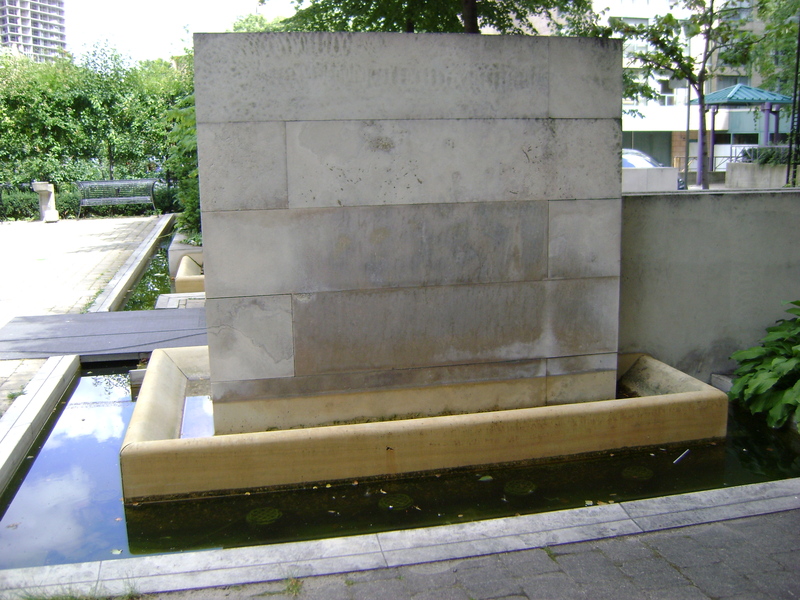 It is behind the old Adelaide Street courthouse, and the small street behind it is called Court House Lane. 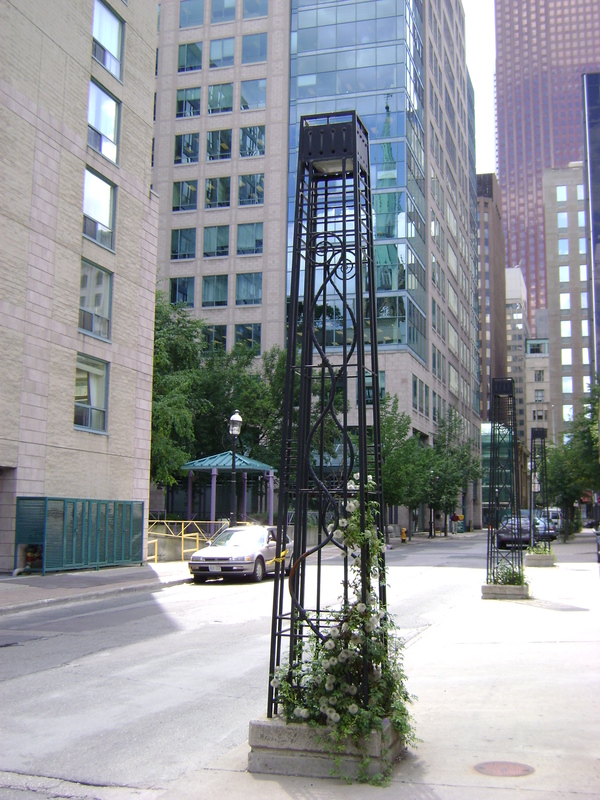 It was designed by Janet Rosenberg, who is a very famous landscape architect in Toronto. The course I was taking was called Landscape Building and Materials, and the instructor wanted us to see all the different materials that were used. These pictures were taken last summer, when Toronto was in the middle of a strike, so excuse the weeds, long grass and garbage. We are not always like that. I love the polished granite, window. Love the contrast between the shrub and the yew, the play of light and dark. But what I love the most about this tiny, tucked away garden is this, look at the gorgeous espalier on the metal structure. It looks great, summer or winter. Ignore the snow, I took this picture after one of our rare snowfall, back in February. A close up of the espalier. 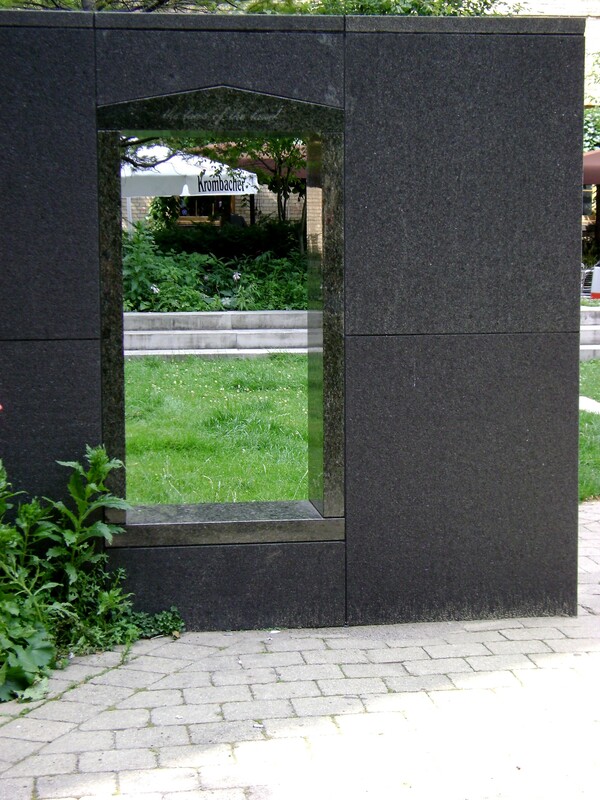 These would be such a great feature to give your garden some privacy, and takes up very little room. 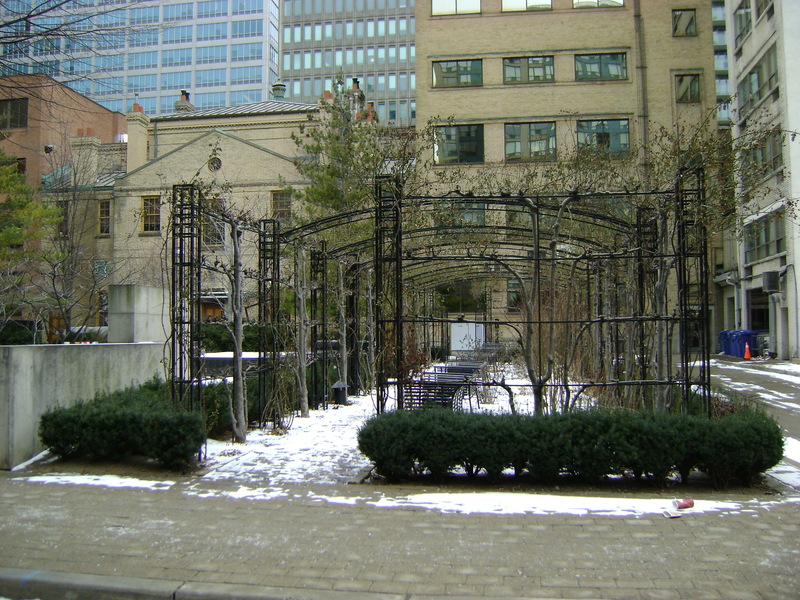 This was taken in January, just after they pruned the espalier for the year. 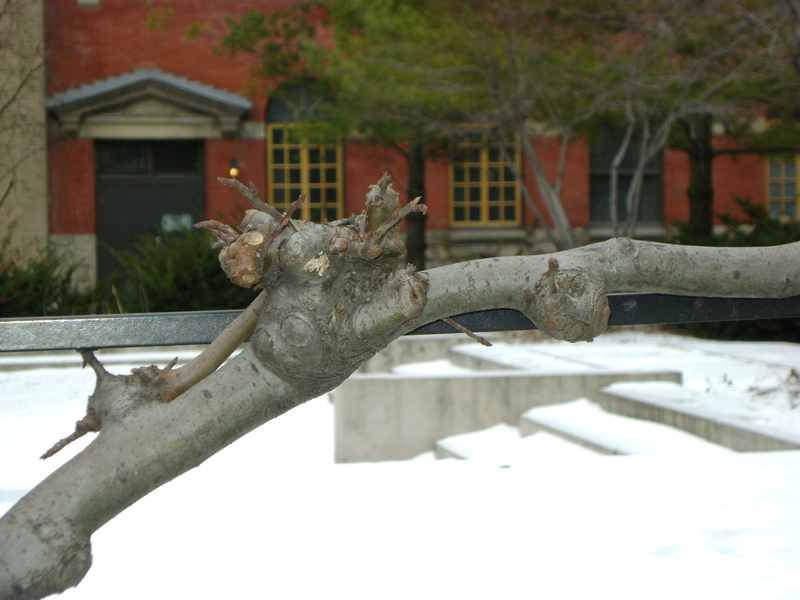 A closeup of the branch after pruning. You can see the fruiting spurs that have been kept. At least, I assume that is what they are, never having pruned a fruit tree or espalier in my life. and are very sculptural in winter. This is the spot where I found the snowdrops in flower, I told you about in Mondays post. I do not know why more public gardens do not plant these, they are not any trouble. 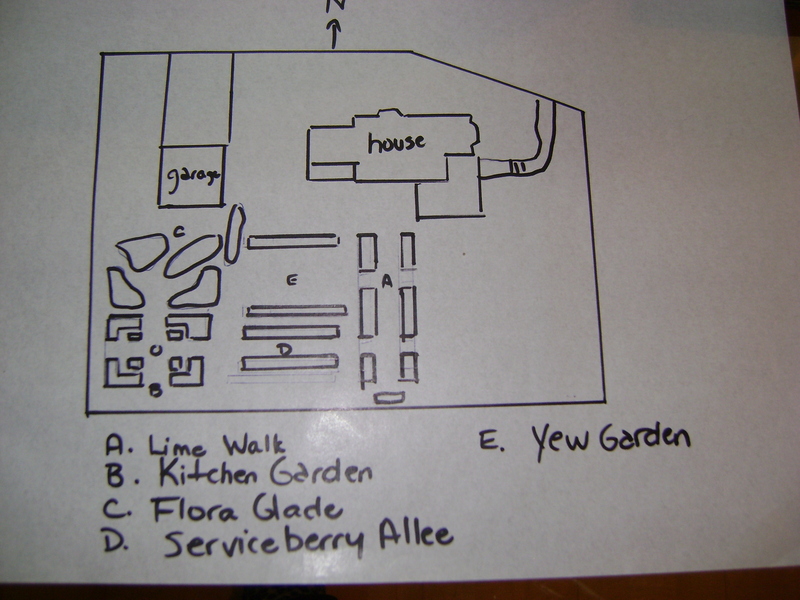 The very first garden feature that I drew on my plan was the “Lime Walk”. I have always wanted a Lime Walk, starting with my first glimpse of Sissinghursts, and I am currently in love with Monty Dons (and him as well). They were in many parks when we lived in England and I love the strong architectural lines. This is what I wanted to see when I washed the many, many dishes at my kitchen sink. 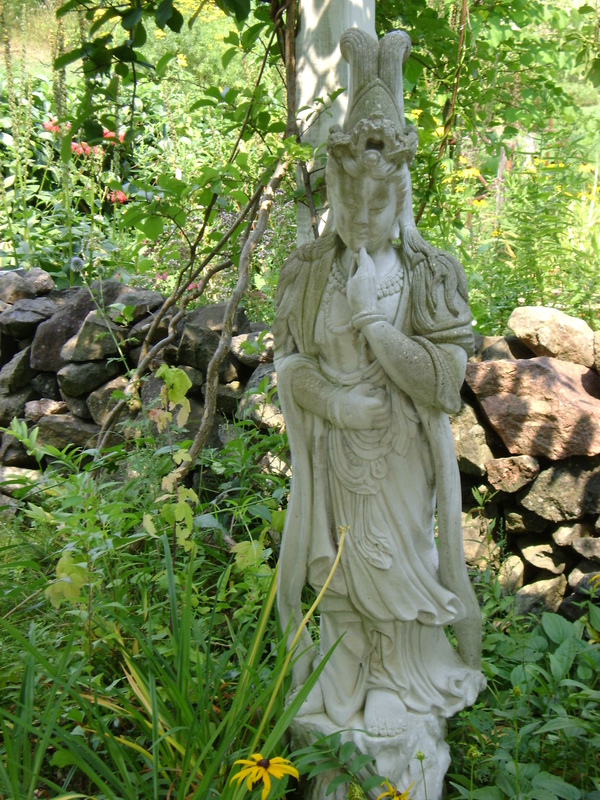 I designed it so you look the full depth of the garden (from the house approx 75 feet) and one day will have a focal point at the end, a statue or a big urn on a pedestal. You can read more about how I laid it out here. I also wanted a “Kitchen Garden” or potager. I do want to be able to grow some veggies, when we are living there full time, and I also want to use this as a holding area (for those impulse purchases that every gardener makes), gifts from friends, plants growing from seed, and flowers for cutting for the house. We built this in the second sunniest spot on the property (the first being saved for a swimming pool, hopefully). It happens to be as far away from the house as you can get, most of the bigger trees are planted around the house (great for keeping it cool inside, Mother Natures air conditioner). We have a berm, on the south and west side of our property, redirecting water run off from the Niagara Escarpment, away from the house. So after leaving a three foot path at the bottom fo the berm, we started building the raised beds for the Kitchen Garden. You can read about it here. The north dividing wall for the Kitchen Garden is a cedar hedge. 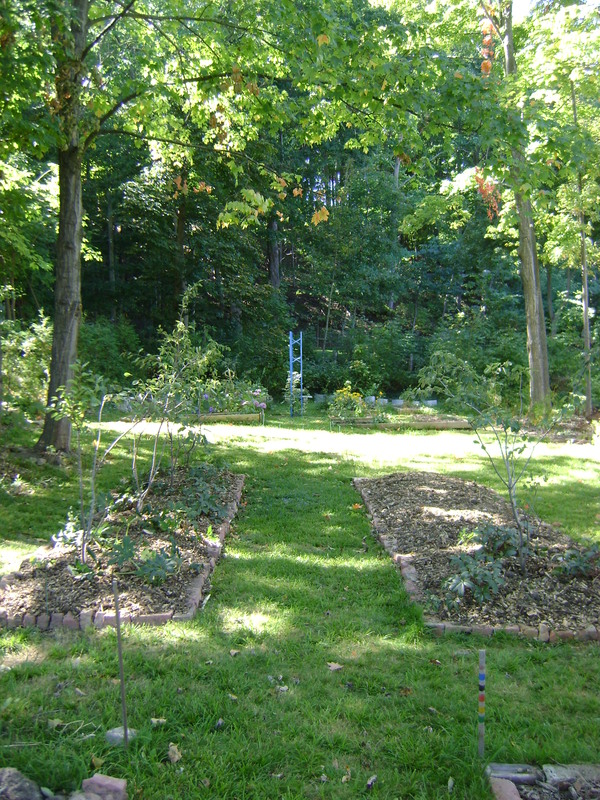 On the other side of that hedge is the second garden that I made, the Flora Glade. This is the area immediately behind the garage, and there were two clumps (thats the technical term) of silver maples. One of two and the other of three, approx 15 feet away. 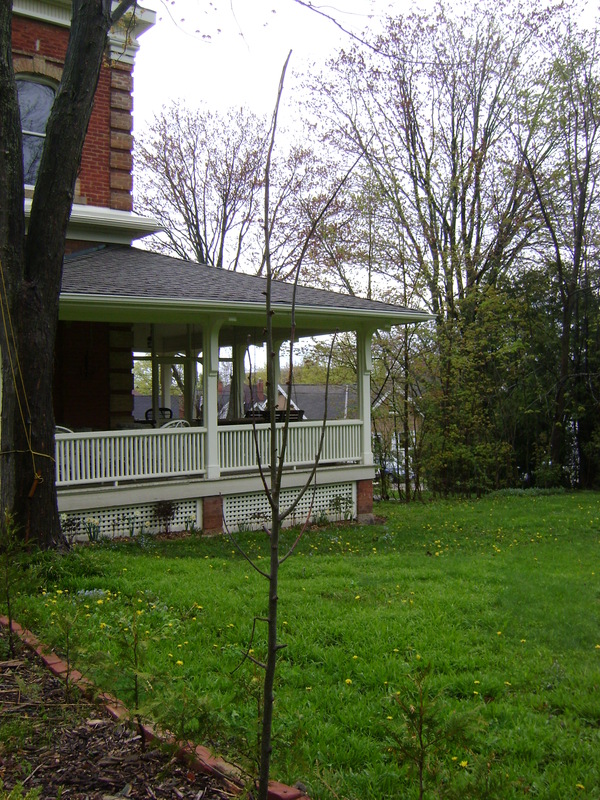 Also there is a large silver maple and a red maple on the south east corner of the garage. So a lot of trees, actually a grove of trees! This has become the most informally planted area, except for a straight hedge on the south and east side, all the beds in here are curved. You can read about it here. 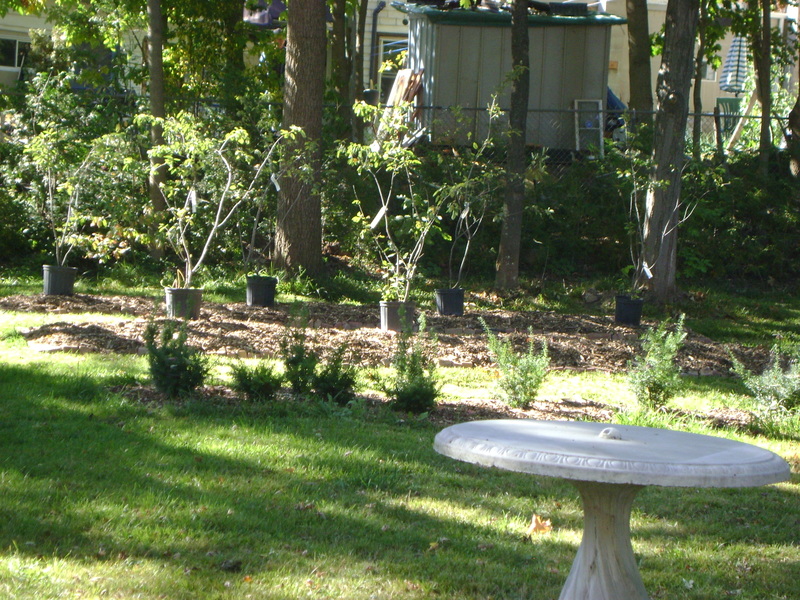 The last garden I have laid out is the Serviceberry Allee. This was just planted (at least half of it) two weeks ago. It starts from the Lime Walk and runs to the Kitchen Garden. You can read my post on it here and here. OK, no laughing, this is a very roughly drawn (on my dining room table) map of what I have accomplished so far. (Perhaps when I have time this winter, I will attempt a more detailed drawing.) I did not draw on the cedar hedge that separates the Kitchen Garden and the Yew Garden from the Flora Glade. The Yew Garden consists of two freshly planted yew hedges, running east and west, with lawn in the middle. You can read about that here. I have not decided what I will put in here, although a million and one ideas are swirling through my brain. Water feature, parterre, oh what to do? Oh well, lots of time to think about it, and certainly no rush to do anything. 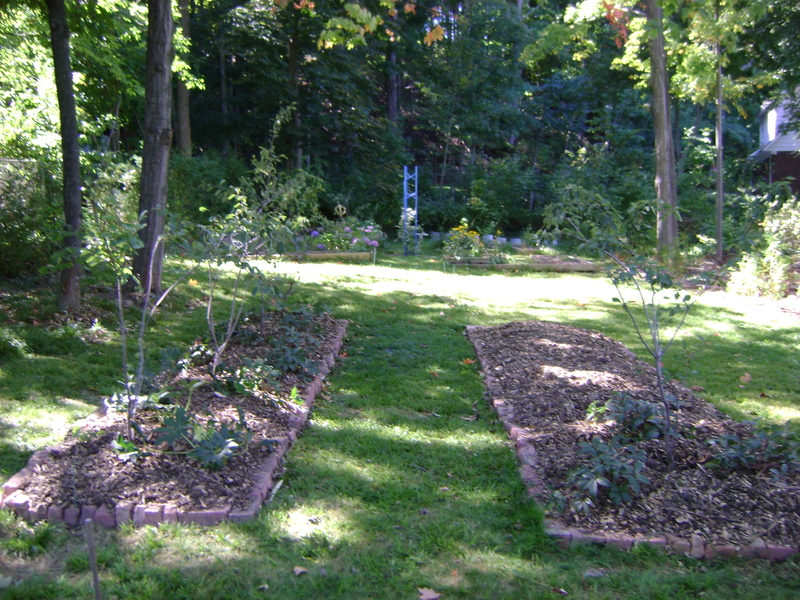 You can see how the garden is divided into three sections, one behind the garage, and one behind the house. The third, that we refer to as the Croquet Lawn is currently reserved in my mind for the pool. In the spring, I hope to address the problem of a path from the driveway to the front door. 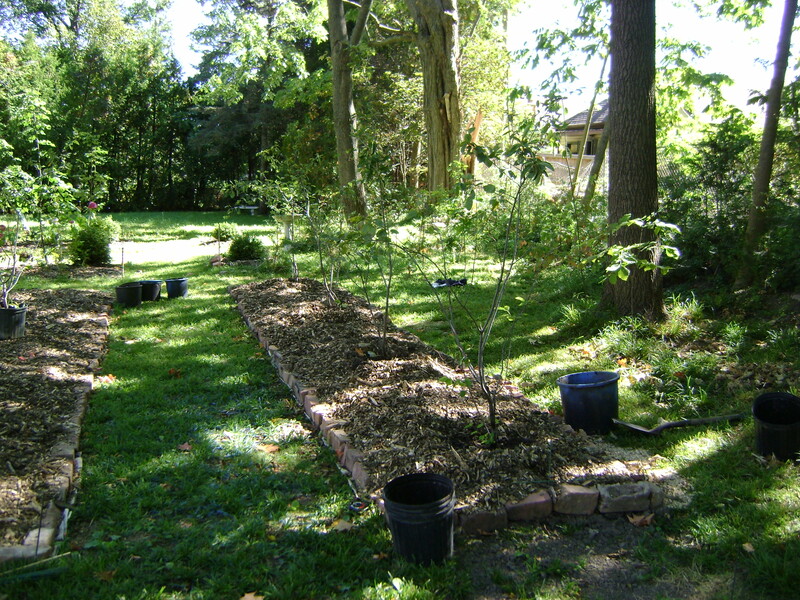 I already started by planting a row of Emerald Cedars on the north side of what will be a path. You can read about that here. I will post pictures on that if and when it happens. OK, maybe I shouldn’t have done it, am I jumping the gun a bit? Did I give enough agonizing thought to the tree selection for my allee? I had tons of great ideas, especially Teza’s cornus’, but I worried that having two lines of 7 cornus (14 in total) was asking for trouble, not only very expensive to buy, but maybe marginally hardy, what if one or two died, it would take forever for them to match up in size. So this weekend Ian was sailing in the Canadians, and I was driving up to Kilbourne Grove by myself. Really, he had only himself to blame. He should have known if I was by myself, I would be compelled to visit as many nurseries as possible on the way. I started (and ended) at Humber Nurseries, not because I was tired of plant shopping (that will never happen), but because the car was crammed to the rafters. They had serviceberries 50% off. Obviously I was meant to plant them, the birds will love me and all those cornus’ that Teza suggested, I will get one of each of them and plant them in the Flora Glade (making it even more glade like). After all, I am an instant gratification girl, I don’t like to wait for anything. Gardening is definitely teaching me patience. Here you can see that I just set the pots on top of the beds that I told you about here. I had to work out the spacing. A bit difficult, as I need to put two paths through the middle of the north walk, and one path through the south walk. 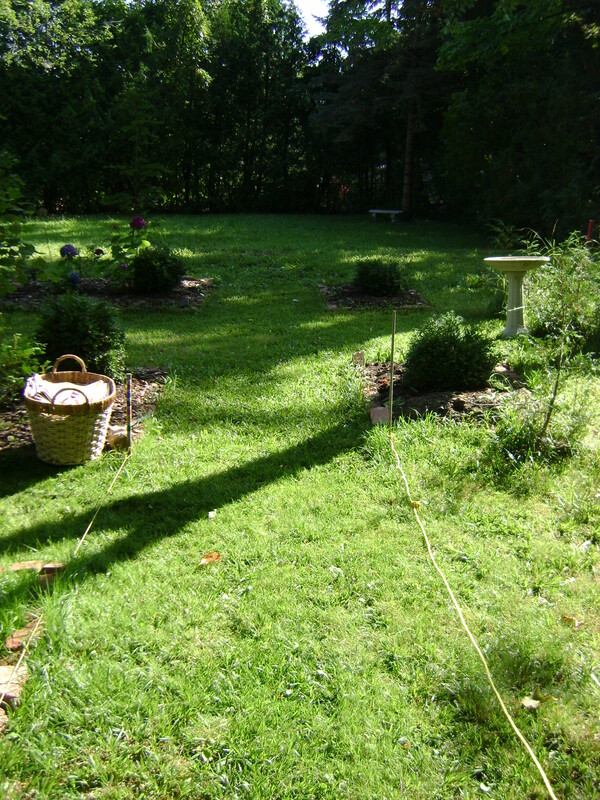 One path enters the Allees north side from the (what I am calling the Yew garden, as it has a newly planted yew hedge on both north and south sides) and also a path from the Flora Glade. The south side has a path exactly opposite the Flora Glade path through the north side (does this make sense?) so you can get to the cedar hedge at the back of the property. One problem, is this has only been worked out in my mind, there is nothing to see here folks. The south side is planted. Here you can see the whole thing from the kitchen garden, as much as you can see, it was a sunny day, the middle of the afternoon, not the premium time to be taking photographs, but needs must. And from the Lime Walk. You can see that only one serviceberry has been planted on the north side, add that to the 4 on the south equals 5. Did I not tell you that I bought 6! When I went to plant the 6th, I hit the uncomposted materials that I had dumped in here, before covering with a layer of topsoil and bark mulch. 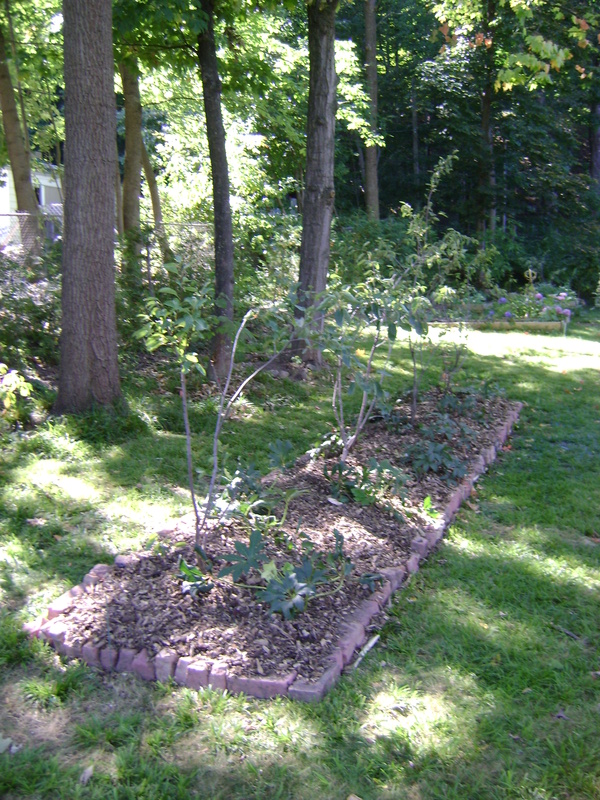 The other side and the end where the first serviceberry were planted, is straight compost. So I have heeled the 6th serviceberry in the Kitchen Garden for the winter. In the spring the compost should have rotted down and I can transplant it then. I had a lot of helleborus from the shop. I have been holding them in the Kitchen Garden since April, and they have done very well. I transplanted them to the Allee and underplanted with Bridal Crown narcissus, Woodstock hyacinths and (a perpetual Kilbourne Grove favourite) muscari. I still have a long way to go. This portion of the Allee is 20 feet with a 4 foot path dividing it from the Lime Walk. I am going to continue all the way to the Kitchen Garden (had toyed with the idea of making a different “room” there, but I worry that I am getting a bit “botanical Garden” like, to quote my Landscape Design professor). The Allee will end up at 45 feet long and there will either be 7 or 8 trees on each side. (I did have it counted and measured, but that is up at Kilbourne Grove and I am sitting in my Toronto condo, so I am guessing). 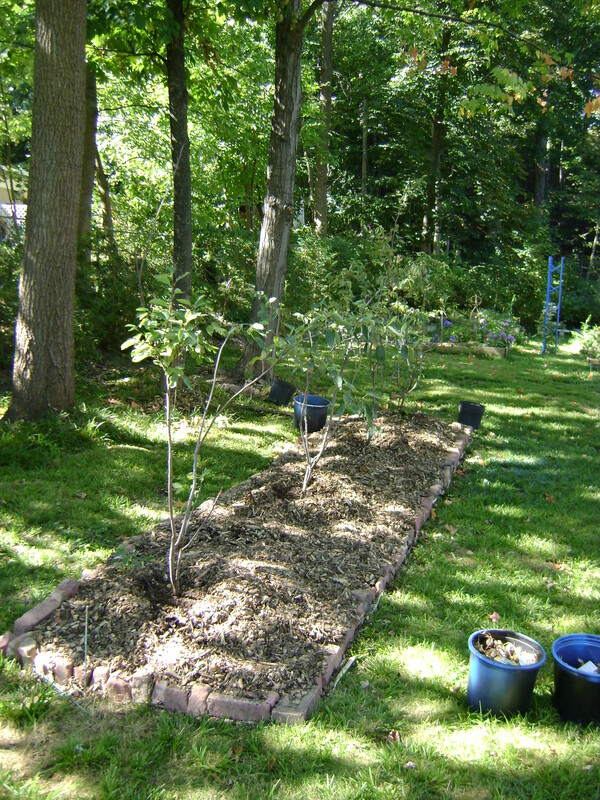 I will not be able to get back to Humber and get more serviceberry this year, (it is a bit out of my way), not to mention I don’t even think that I will get the other portion of the Allees beds made. There is still tons of bulbs to plant, peonies to transplant and leaves(in the future) to rake. I think this will become a spring project. Who doesn’t love long weekends! And finally a perfect one, sunny and not too hot, perfect working conditions in the garden. And my garden needed it! The grass has not been cut since August 8th, and that was only the area immediately around the house (just so the neighbours realize that we still live there). Between the weather, and personal commitments the rest of the garden was last cut on July 19th. Yikes! So it took a bit longer then normal. After all, I was spending a lot of time on each spot, first I would have to do a wheelie with the lawnmower, so the blades were high up, and then slowly lower it down over the grass. This did a satisfactory job, but I would really like to be able to cut it on a more regular basis. At last, I could get to the fun stuff. I have decided to plant an allee, stretching from the Lime Walk to the Kitchen Garden. 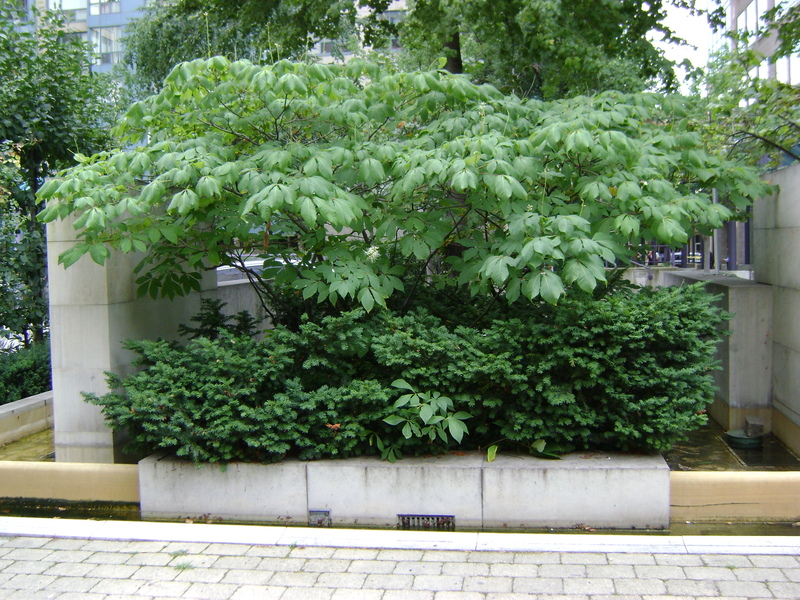 I have been mulling over in my mind for a long time, what kind of tree I should use for the allee. I didn’t want as formal a look as the Lime Walk, but I still love my straight lines. 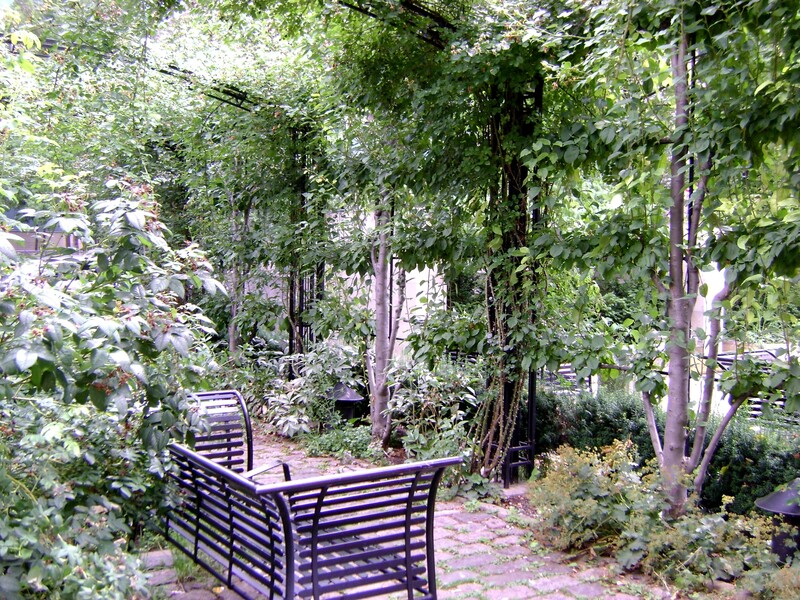 Something flowering would be nice, and it is a shady area, as there is 6 large maples and ash trees, whose canopy overhangs it. So it would need to be an early flowerer, who is mostly finished by the time the trees leaf out. I wanted something multistemed, because I want to have a bit of a tunnel effect. I think (and I could be wrong) that this will give me more of a closed in feeling. So we laid out the beds for it, they are 20 feet long and 6 feet wide (at the moment). I took the opportunity to empty the three plastic compost bins that were at the house when we purchased it. Some of the compost was still quite rough, so it went on the bottom and the more finished went on top. This created quite a hump in the middle, that will break down and settle over the winter. 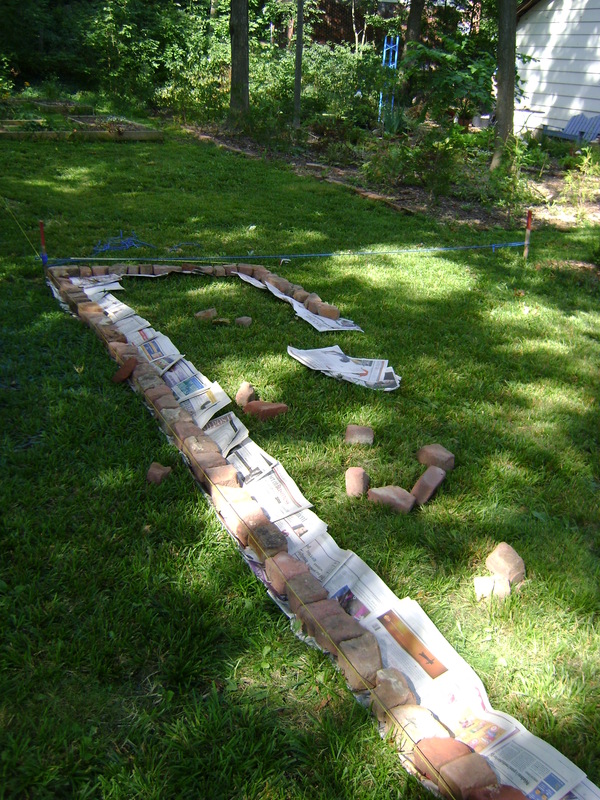 I created it using the “lasagna: method, of laying newspaper and cardboard directly on top of the grass, then my rough compost and then a layer of finished. I topped all this with a layer of bark chips from my tree (that blew down a couple of weeks ago). I started by pounding in a post next to each bed of the Kitchen Garden. (Forgive me the pictures, I was working in the middle of the day, so it is very shadowy). And then I did the same thing at the Lime Walk. As this is only a secondary path through the Lime Walk, it is only 3 feet wide. 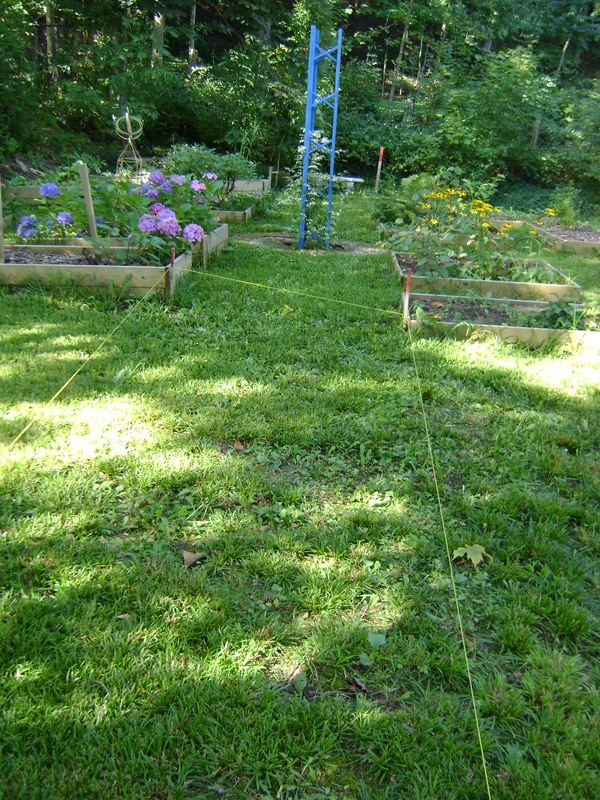 The Kitchen Garden path is 5 feet wide. So the path narrows as it approaches the Lime Walk. I hope that when you are standing in the Kitchen Garden, looking east towards the Lime Walk, it will seem even further away, due to the optical illusion of the path narrowing. The easiest way to get this straight is to tie a rope between the posts. Once I had my straight lines, I began. 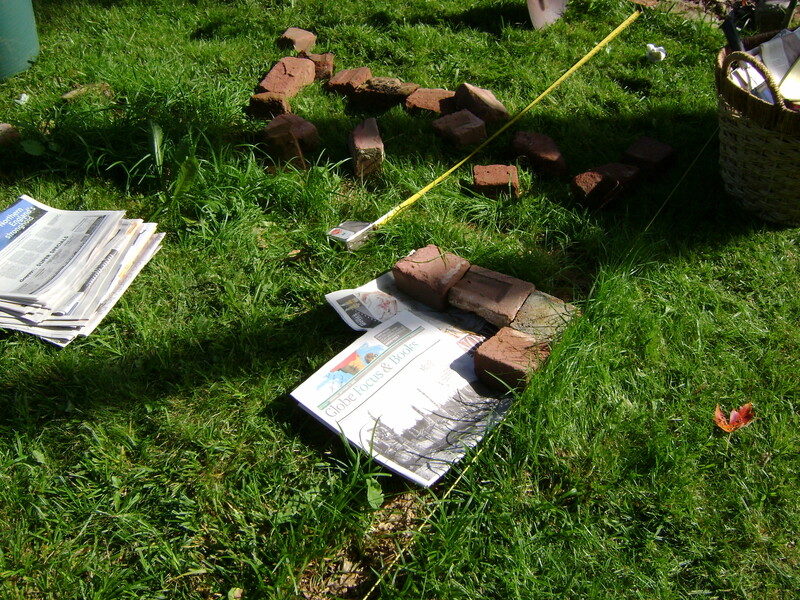 Newspaper underneath and bricks to outline. It went fairly fast. This is how I have laid out all my beds at Kilbourne Grove. You can see how much more sun I have in this area now, after losing our huge, old maple. I hope the hydrangea in the Lime Walk will be able to cope. Here we are starting to fill the bed with the rough compost from our bins. You can see in the background a bit of our garden. The yew hedge is directly north of this bed and it is the same length. This allows for a 4 1/2 foot wide path from running south along the Flora Glade. Finished the first bed, starting the second. I won’t bore you with any more pictures of this (especially as the beer didn’t allow me to finish the second), it’s just more of the same. 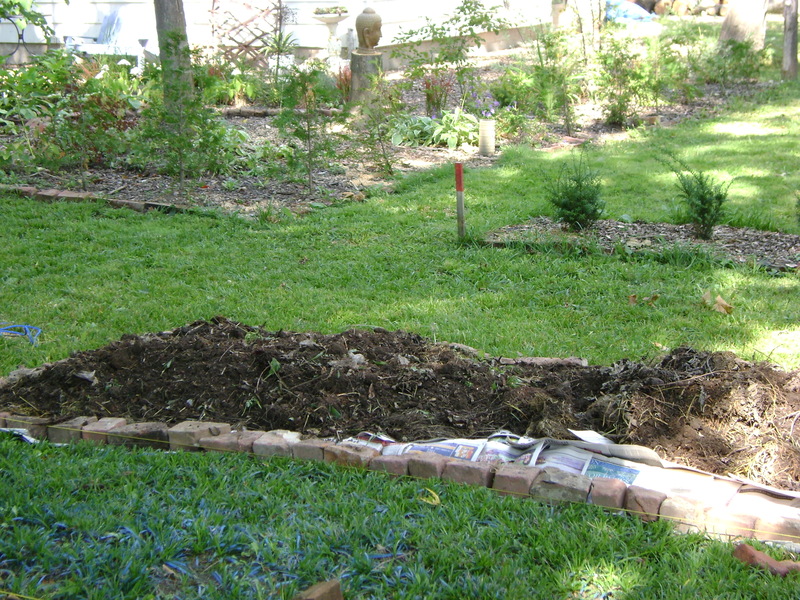 Got the bark mulch on, so no weeds (ha), and I will plan what to plant here. By the time the beds settle, it will be spring, and I will be able to plant. I also have approx 12 helleborus in the Kitchen Garden, waiting to be transplanted here. I stopped the beds at 20 feet, in line with the yew hedge. 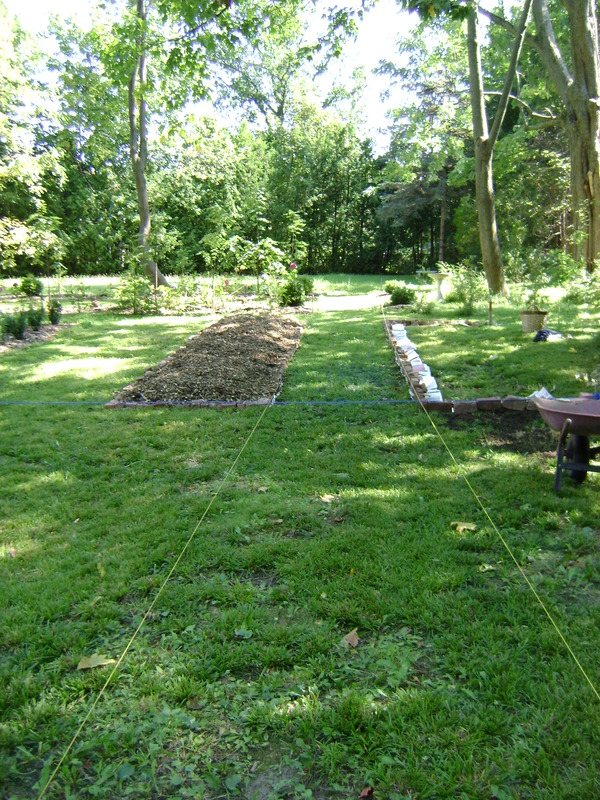 This gives me a square garden, aprox 25feet, between the allee and the Kitchen Garden, I am not sure if I want something different here, or if I will continue the allee all the way to the Kitchen Garden. So I am leaving it for now, I can always extend it in the spring. 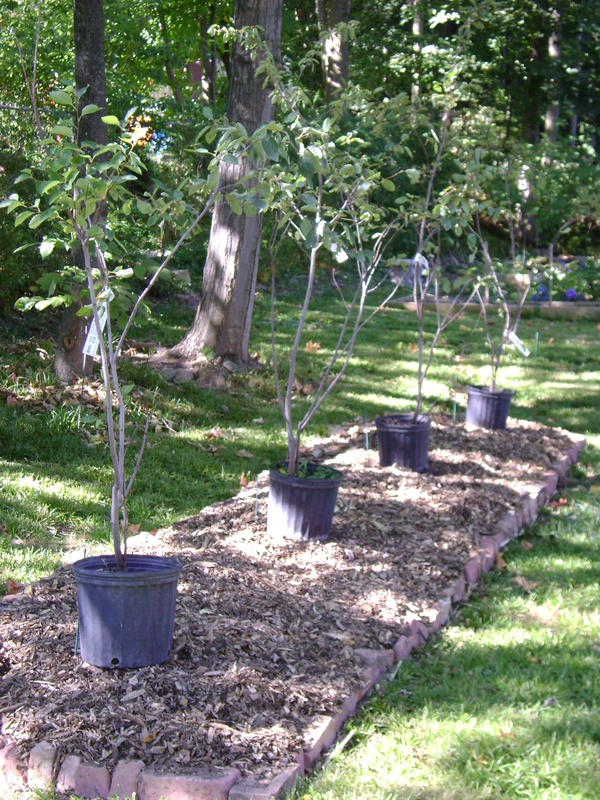 I am thinking of serviceberry for the allee, but does any one else have any other ideas? Owen Sound is Zone 5B, if that helps.